Last weekend I did cross-country running for the first time since school. There's only one photo of me from that era and here it is. 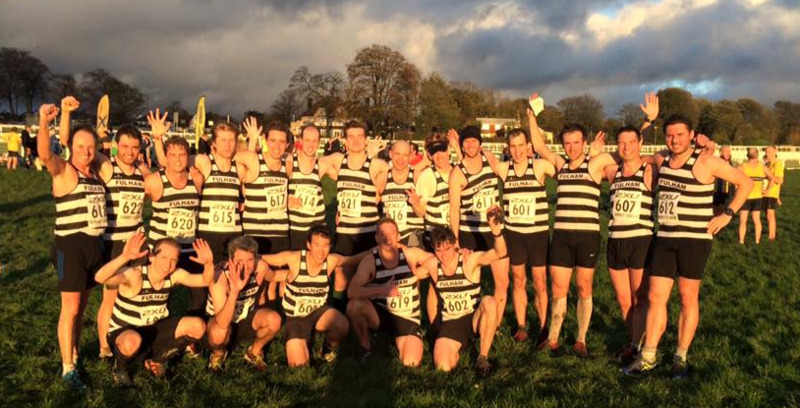 It was five minutes before the start of the Surrey League Division 4 cross-country race. Max, Kevin and I were sitting in Bob's car as the rain hammered down. It quickly transpired that for all of us, this was our first XC race since school. And for some of us that was a very long time ago indeed. "We only need 10 finishers to qualify for the points and there are 18 people here," said Max. "They don't need us at all. Shall we stay here?" It was certainly very tempting. But getting wet and muddy seemed to be the only prerequisite for cross-country, with running a distant second and I reckoned I could manage at least one of those. For the record, my two other goals were to not fall over and to not get lapped. Having finished a highly creditable second place in the first round, Fulham Running Club's Men's team was looking to go one better in the second outing. With the first 10 placings counting towards the club's overall score (1 point for 1st place, 2 for 2nd and so on, with the lowest points total winning), it was important to get at least 10 runners finishing. With nearly double that number turning up at Epsom Downs on a windswept afternoon in November, things were looking good. With everyone decked out in the black and white hoops of FRC, we all trotted down towards the start line and did a half-hearted warm-up while the rain sheeted down. By the time we'd lined up at the start and been told it was two laps, it had stopped raining but I was already 100% wet. I reminded myself to use this extra weight to my advantage on the downhills. The first of these came immediately as everyone charged down the hill towards the first corner. Grass soon have way to gravel and then mud, and before long people had given up avoiding puddles. I hadn’t worried too much about shoe choice as I only had ‘road’ and ‘trail’ to choose from, but Bob had invested in some shiny new spikes for the day. And then lost half of the spikes while warming up in the car park before the start. Still, he didn’t fall over so they must have done him proud. Within five minutes of the start I saw the first casualty of the day as a man limped off the course looking glum (amateur diagnosis: twisted ankle) and I redoubled my efforts in watching foot placement. Up the first hill we went, around a corner and up some more before doubling back on ourselves and down down down to a tight corner with a steep drop. Looking ahead there was a long incline. I found out later on Strava this section had been named Grassy Monster Hill Climb and it lived up to its name. At the top, there was another casualty, a man on all fours and two teammates telling him he should rest despite his protestations. We weren't 15 minutes into the race so he must have put in one hell of a shift to be broken so soon. Either that or he wasn’t a runner at all and had been drafted in to make up the numbers. Once at the top, I caught up with and passed Phil, and came through the lap mark in about 19 minutes. Now it was all about hanging on. Whether it was the mud or my lack of fitness but even running downhill felt laboured and the ups were even harder. The field was much more spread out now and I couldn't see any other Fulham runners until I came down the hill before the Monster where I saw Jonathan storming up it, overtaking several fading runners. Some of them were even walking so I assumed they must be ultra runners who had forgotten what event they were doing. Despite the temptation, I managed a slow trot up the hill and gave Phil a gasp of encouragement as he shot past me. The flat at the top wasn't enough to get the legs going fast again but once I glimpsed a gaggle of black and white vests near the finish I knew I had to give it a blast on the final descent and passed one runner before crossing the line in a muddy windmill of arms and legs in just over 39 minutes. Not bad for a little over 5 miles at my advanced years! I found the FRC runners who had already finished who were standing around like they hadn't actually done the two laps. After cheering, clapping and shouting for the remaining teammates as they filed in, the sun came out just in time for it to set on a glorious afternoon of off-road fun. As the sun set and we were about to head home, we noticed someone still out on the course with the course sweepers collecting the marker flags after him. A look at the results shows it was Alan Lane of Vets AC in the V80 category. What a legend. I hope I'm still doing cross-country when I'm over 80 years old!